Then one hot Sunday afternoon, when we were at the pool with Jamie’s parents, Eliza said to me, “You know what I was just thinking? ‘I’m in the pool, it’s summer, I’m seven years old, I’m wearing a very cute bathing suit, and my grandmother is asking me if I want anything to eat or drink.’” By which she meant: Life doesn’t get better than this. 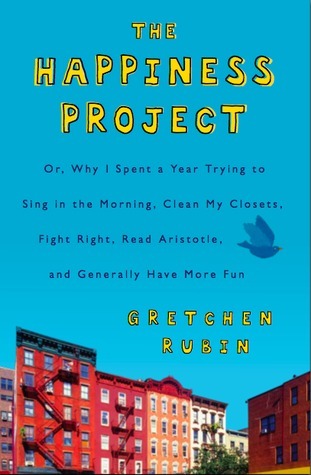 In The Happiness Project, Gretchen Rubin writes about her year-long journey towards becoming a happier person. As a very detail-oriented perfectionist, she finds herself becoming too negative at times, so she decides to focus on improving on certain things every month, making resolutions like “Enjoy the fun of failure,” “Make time,” and “Don’t gossip.” Throughout the book, her struggle to keep her resolutions and continue becoming happier clashes with her impulse to argue with people and get bogged down by small problems, culminating into hilarious situations. What I especially appreciated about The Happiness Project is that while it was funny, it was also very insightful and intelligent. Saying that Rubin did her research is an understatement. In the book, she quotes and discusses Benjamin Franklin, St. Thérése, Aristotle, the Dalai Lama, Francis Bacon, Henry David Thoreau, Samuel Johnson, and Victor Frankl, to name a few. She brings together an incredible amount of (oftentimes conflicting) advice about happiness, sifts through it, and makes sense out of it. Later in the book, Rubin discusses how she has a habit of taking notes every time she reads a books. She writes that she keeps books of quotes from things she’s read. Reading about her note-taking habit really inspired me to start being a more active reader and taking more notes when things strike me as important. I often find myself struggling to find a certain line from a certain book so I can write about it. Writing quotes down to begin with would completely solve that problem. I loved so much about this book– but mostly, I loved it because I really related to Rubin. It was so exciting to read about someone else who had just as much enthusiasm for resolutions as I did, and it inspired me to be more grateful and enthusiastic about everyday things. Like many recent graduates, I’ve been doing a lot of soul-searching, and this book helped me refocus on “the big picture” rather than day-to-day stressors. Besides that, I nearly squealed with delight when Rubin discussed participating in National Novel Writing Month, an event I have enthusiastically participated in for the past seven years. This was an entertaining, fast-paced, enlightening read, and I highly recommend it.